Photo credit to Wetaskiwin Heritage Museum courtesy of the Red Deer Archives. 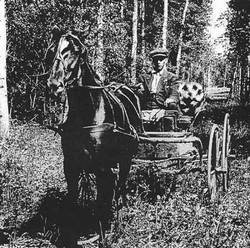 Transportation in the mid 1800s in the Wetaskiwin area was more likely on your horse and buggy, rather than any Mercury. Getting on a well worn trading trail that First Nations and fur traders carved out would be as good as it got. These early trails were the first highways to the west. When Fort Edmonton became an important trading center for the three main Indian tribes in the area, clearly marked trails guided their travels from their buffalo hunting grounds to the North Saskatchewan River. At times there were skirmishes on these trails between the Blackfoot and the Cree. “The Hudson’s Bay Company tried to discourage the tribes from trading at the fort at the same time in order to lessen the murder and mayhem at their very gates”. The trails were just footpaths and were created out of necessity. Water routes were the major determining factor for where pioneers would settle before roads were put in. Today for us, it is a simple 3 hour drive in the luxury of our vehicle from Edmonton to Calgary. In the 19th century it was a slow uncomfortable, muddy and often dangerous 4 day journey. The stopping houses and halfway houses “were a godsend, providing livery services, a home cooked meal, a place to clean up, and a warm bed”. In the fall of 1873 John McDougall took it upon himself to make some improvements to the Edmonton to Calgary Trail, and with a group of volunteering men, felled trees, cut brush, and made the trail passable for wagons and cattle. In 1873 the North West Mounted Police established Fort Calgary. This furthered the need for more trail improvements and thus the Calgary/Edmonton trail was born. Already essential for the fur trade, the trail also became important for settlers in the West, as they braved the untamed landscape to establish homesteads. The trail was given two names depending on which way you were travelling. It was either the Edmonton to Calgary Trail or the Calgary to Edmonton Trail. Was that the beginning of the rivalry between the 2 cities, based on the fact that one could not stomach the thought of having their northern or southern counterparts name used first? Hmm, we will have to look that one up. In 1891 when the railway from Calgary to Edmonton was completed, many thought this would slow the trail use down. It was much easier to spend 12 hours on the train than 4 days on a cart. However money was a factor and alot of people couldn’t afford the luxury of the train, so they would continue to take the coach instead. The use of automobiles was still almost 20 years away. By 1892 several homesteads had been established along the way, with regular mail service arriving in 1884. The trail was mapped and surveyed in 1886, and “a comparison with that of explorer David Thompson shows that the trail had changed very little over 200 years”. Several other trails were also in existence back then. The Battle Lake Trail went around the North side of Battle Lake. It was used by First Nations people as well as pioneers and missionaries travelling to Buffalo Lake and Rundle Mission on Pigeon Lake. The Old Pigeon Lake Trail was another, a mail route was established from Wetaskiwin through Westerose and out to Yeoford three days a week. This connected the west to the thriving community Wetaskiwin had become. The Edmonton to Red Deer Forks trail meandered from Edmonton to the fork of the South Saskatchewan and Red Deer Rivers, connecting the city to these very important waterways. Other trails such as Todd’s Crossing, the Agency/Buffalo Lake Trail and Tail Creek trail were also in use and equally important. The opening of the west depended on waterways, trails, roads and railways. The men responsible for exploring and constructing these pathways go down in history as the forward thinkers of their time. The next time you get in your luxury vehicle and are cruising from Edmonton to Calgary, think about what it would have been like before John McDougall and his men cleared trees and brush, and how you would get across any waterways. As we move into the future one wonders what is next. A hundred years from now we will probably be looked at as deprived and primitive. Today I will not mind it a bit as I get in my nice truck and drive home. References: Siding 16 Vol. 1, Wetaskiwin Heritage Museum, The City of Wetaskiwin Archives.